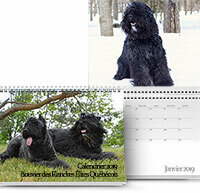 Order immediatly your 2019 calendar created and offered by Bouvier des Flandres Élites Québecois. Our calendar features beautiful bouviers des Flandres in Québec in our natural environments and/or in their prefered activites. 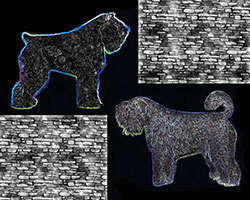 If you are a bouvier owner and would like to learn how to groom yourself your dog ! This Video could initiate you with some tips to do so. The Video is in french only. You could also assit to one of our Grooming Seminar ! To find out when or where will be our next seminar, you can write to monique.p@videotron.ca and we will get back to you with the informaiton. Click on the DVD to see the demo. Our goal is to participate in the protection of our breed by choosing an ethical code of breeding with superior requirements for the health of our dogs, breeding stock and their offspring. We have chosen a selective breeding in regard of keeping the best outspring (generally better than the parents), to improve our blood line and to maintain its integrity. We have chosen to work on quality instead of quantity. Our main concern is to promote health tests for our dogs and to encourage the breeders in achieving different titles, allowing our Bouviers to stand out in their activities. Also, we want to use this tribune to inform, advise and make some prevention towards the public. For us each letter of the word Elites as a meaning in its French and English writing in exception for the first and the last letter. We promote health tests on our breeding stock to limit and avoid any descendant with hereditary illness or undesirable gene carrier. Definition for the word « Elite »: « distinguish itself by great qualities ». Our common and main quality is ‘’conscientious’’ which the definition is: « governed by or done according to somebody’s sense of right or wrong ». No breeder can guaranty that he will obtain perfect puppies without any health problems. But he has to assume its role and not repeat any previous mistakes. He has got to be conscientious and consequent in his actions and principles. Any conscientious breeder of Bouviers Des Flandres is welcome, if he is willing to commit to promote, respect and share our ethic code in the best interest of the breed. This website has been edited without any pretention, but with great conviction. We believe into our great breed and are hoping to help you into making judicious choices.